Brian Peter George St John le Baptiste de la Salle Eno, RDI (; born Brian Peter George Eno, 15 May 1948) is an English musician, record producer, and visual artist best known for his pioneering work in ambient music and contributions to rock, pop, electronic, and generative music. 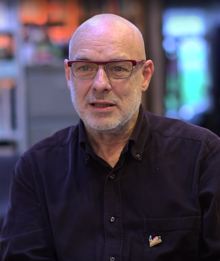 A self-described "non-musician", Eno has helped introduce a variety of conceptual approaches and recording techniques to contemporary music, advocating a methodology of "theory over practice, serendipity over forethought, and texture over craft" according to AllMusic. It's insane that, since the Beatles and Dylan, it's assumed that all musicians should do everything themselves. It's that ridiculous, teenage idea that when Mick Jagger sings, he's telling you something about his own life. It's so arrogant to think that people would want to know about it anyway! When I started making my own records, I had this idea of drowning out the singer and putting the rest in the foreground. It was the background that interested me. Software options proliferate extremely easily - too easily, in fact - because too many options create tools that can't ever be used intuitively. Intuitive actions confine the detail work to a dedicated part of the brain, leaving the rest of one's mind free to respond with attention and sensitivity to the changing texture of the moment. Most game music is based on loops effectively. I don't want to do free jazz! Because free jazz - which is the musical equivalent of free marketeering - isn't actually free at all. It's just constrained by what your muscles can do. A way to make new music is to imagine looking back at the past from a future and imagine music that could have existed but didn't. Like East African free jazz, which as far as I know does not exist. I'm actually an evangelical atheist, but there is something I recognise about religion: that it gives people a chance to surrender. People do dismiss ambient music, don't they? They call it 'easy listening,' as if to suggest that it should be hard to listen to. If you're in a forest, the quality of the echo is very strange because echoes back off so many surfaces of all those trees that you get this strange, itchy ricochet effect. I often work by avoidance. Editing is now the easiest thing on earth to do, and all the things that evolved out of word processing - 'Oh, let's put that sentence there, let's get rid of this' - have become commonplace in films and music too. Lyrics are always misleading because they make people think that that's what the music is about. Gospel music is never pessimistic, it's never 'oh my god, its all going down the tubes', like the blues often is. The big message of gospel is that you don't have to keep fighting the universe; you can stop, and the universe is quite good to you. There is a loss of ego. You either believe that people respond to authority, or that they respond to kindness and inclusion. I'm obviously in the latter camp. I think that people respond better to reward than punishment. The Marshall guitar amplifier doesn't just get louder when you turn it up. It distorts the sound to produce a whole range of new harmonics, effectively turning a plucked string instrument into a bowed one. My guitar only has five strings 'cause the top one broke and I decided not to put it back on: when I play chords I only play bar chords, and the top one always used to cut me there. Pop music can absorb so many peculiar talents, ranging from the completely nonmusical poseur who just uses music as a kind of springboard for a sense of style, to people who just love putting all that complicated stuff together, brick by brick, on their computers, to people like me who like playing conceptual games and being surprised.